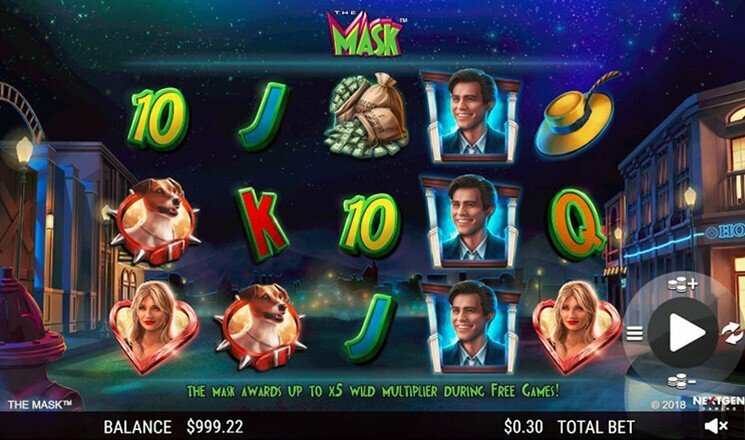 The Mask Slot is 5 reel, NextGen Gaming powered video slot, with 20 paylines. Theme of the video takes its inspiration from the 90’s classic comedy “The Mask”. Design of the slot is goody and cartoony as the movie itself, with the high quality graphics by NextGen. Low paying symbols are your standart playing cards (10’s, J’s, Q’s, K’s and A’s), whereas high value symbols are different movie related items such as: The Mask’s hat, Milo the dog and money bags. In addition 3 main characters Stanley, The Mask and Tina make their appearance as well. Game also have Wild (Letter) and Scatter (Bonus) symbols. Before investing real money players can try The Mask Slot for free, or visit any NextGen casino such as: Mr.Bet Casino, Mr Green Casino, Campeon Casino and others to play with real money and win. All the game controls are placed on the right side of the reels. There you can find “Bet amount”, “Settings” and “Spin” buttons. The Mask video slot have 4 different randomly triggered features. All 4 features are connected with Wild symbols, 2 features are activated before spin and 2 after. Alarm Block feature – Hammer runs after the Alarm around the reels, if hammer destroys Alarm, large 2×2 Wild will appear. The A feature – A Wild Masks appears turning randomly any symbol into the Wilds. You can up to 3 full reels of Wilds. By The Horn feature – Mask squeezes Horn, after that selected symbols will be turned into Wilds. During this feature you can get up to 4 full reels of Wilds. Mask Unmask feature – Milo appears covering reels with the Mask. All the Stanley symbols will turn into Wilds. When you get 3 or more Bonus Symbols you will activate Free Game Bonus feature. After the feature is activated you will recive 10, 15 or 25 Free Spins. Number of spins you will get depends on the of Scatter symbols.